This one is definitely for the ladies. I had some raspberry filling leftover from Matt's birthday bundt cake (coming soon!) and I had a divine moment of inspiration. Chocolate + Raspberry = Perfection. Raspberry and chocolate are two of my favorite flavors so I grabbed some Double Chocolate Ghiradelli brownie mix out of my pantry and went to work making a flavor-gasm recipe. The good news---It's super simple. You can whip these up on any day and they will always be a hit. 1. Preheat oven to 350 degrees. 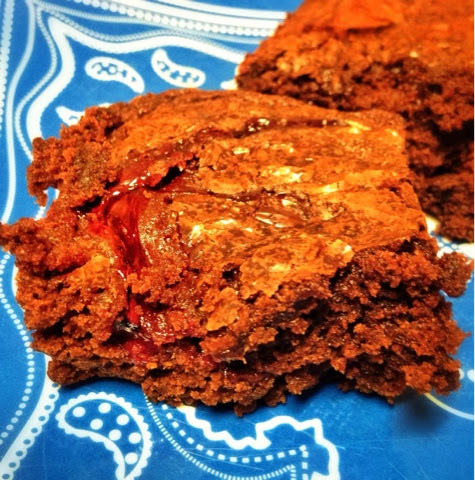 Grease your favorite brownie pan. 2. In a large bowl mix the brownie mix, egg, water, and oil. Pour half of the brownie mix into the greased brownie pan. 3. Spoon the pastry filling over the chocolate. Use the spoon to swirl it evenly over the chocolate. 4. Top with the remaining brownie mix and bake for 40-45 minutes. Delicious! Perfect! Fruity! Chocolate! Amazing! Beautiful! These brownies will make any bad day better and any celebration sweeter. I love the fact that it looks complicated but it actually is so easy! The respberry was an excellent touch! Thanks!